Are you looking for a personalized gift? 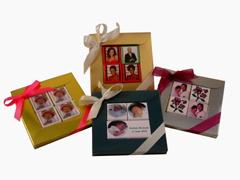 If you are looking for an unforgettable gift to celebrate an important family event: new born, birthday, anniversary, engagement … let us put your favorite photograph on a pure Belgian chocolate! 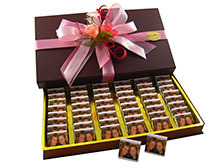 Email us a picture file with your favorite photograph and find out how easy it is to create a great personalized family chocolate gift. 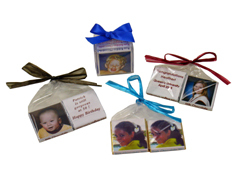 Personal Label Chocolate Gifts for Family Celebrations! Small gifts with picture starting at $1.68 for a mini bag with 2 chocolates. 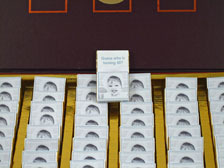 A one time setup charge of $80.00 (per photo and up to 500 chocolate squares) to design and create the wrapper will apply. A special gift for Mom or Dad! The squares (5grm) are available in milk and dark chocolate (70% cocoa); price per square: $0.52. 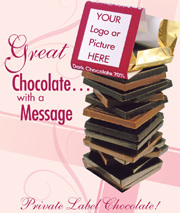 A one time setup charge of $80.00 (per photo and up to 500 chocolate squares) to design and create the wrapper will apply. Are you looking for a branded business gift? Companies looking for that unique differenitator in business gifts for promotional and special events, come to Simone Marie Belgian Chocolate for the best in logoed label chocolate squares and chocolate bars. Our full service offering includes preliminary samples, custom proposal, production and logistics. Find out more about our Business Offerings. It is YOUR COMPANY BRAND and you want THE WORLD to know about it! Companies looking for that unique differentiator in business gifts and promotions, come to Simone Marie for DOLFIN gourmet Belgian chocolates with corporate logo on the wrapper. A custom Belgian chocolate piece presented with elegance, is a sure way to delight your customers and to differentiate your business…. 99% of the world love Belgian chocolate! As well, standard shapes in chocolate (numbers, letters, golf balls, music instruments, world wide globe and much more. can be further customized with logoed printed tags, printed ribbons or printed boxes. All pictures above are samples for thoughts. Contact Simone Marie to discuss your requirements: we would be pleased to custom produce and custom gift wrap specific pieces for your company. Please contact Simone Marie 416-968-7777 to discuss YOUR COMPANY’s BRANDING REQUIREMENTS in detail.